These oatmeal cookies are based on last month's delicious pumpkin cookies, only lacking the pumpkin and spices. Makes about 33 cookies. Add wet ingredients to dry ingredients and stir until they are thoroughly incorporated. Drop by the Tablespoonful onto a cookie sheet that has been lightly misted with vegetable spray. They don't spread out too much; I liked them best when I didn't flatten them out and instead let them stay in little rounded domes. Bake for 14-15 minutes at 350 degrees Fahrenheit. 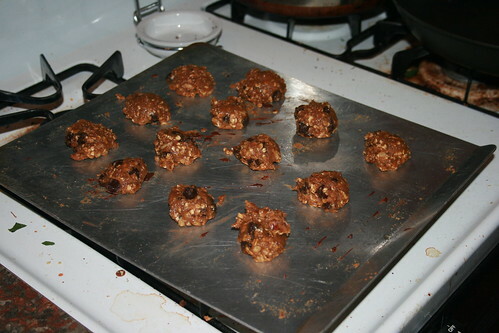 I made these using slivered almonds instead of walnuts and 1/2 cup golden raisins instead of the chocolate chips. Yum! I often don't care for molasses, but here it adds nice dimension to the flavor. Yay! I'm glad it worked out. I don't use molasses very often, either. I love this recipe! I use it all the time (around 5 times so far), to use up the okara left at the end of the day. Although, for me, I omit chocolate chips, walnuts, and molasses. And I often add a bit more okara, if only a little bit is left. Personally, I cannot endure the extreme sweetness of supermarket frosting, so I knew that 3/4 cup sugar would be way overboard for me. Not a single cookie would be touched if I used that much sugar. So I reduced it to 1/2 cup, but., still, I found it too be a bit excessive. 1/3 cup sugar, if you are like me, and prefer mildy sweet things. Think traditional Asian cuisine-- the sugar is merely sprinkled into the food. 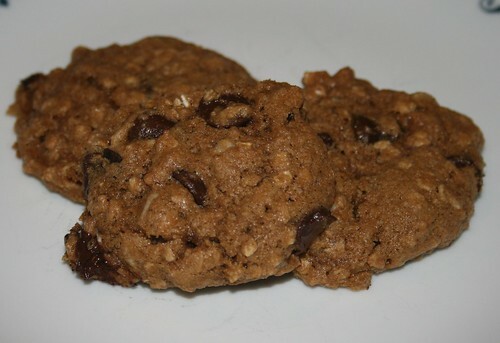 This cookie is soft, moist, and has a wonderful slightly hardened shell, providing a little crisp. The vanilla and sugar (turbinado or dark brown) combine wonderfully, and the taste is very warm and comforting. It's not really vanilla or sugar-- it's something different, like a contented sigh you can taste. :) Thanks for the recipe! Just wanted to add that I have made this using molasses, but I didn't care for the it's deeper complex flavor. It was an umbrella casting a dark shadow over the bright vanilla. Though only a touch of molasses was added, the vanilla could not shine through, and I was disappointed. This isn't a molasses cookie, and if it is trying to be, it is not succeeding. I like it much much more without molasses-- just sugar, okara, vanilla, and salt to flavor. :)) hope that was helpful. I'm glad this worked out for you as a template to adjust to your own tastes! Thanks for sharing your changes so that people whose sweet tooths aren't as out of control can make something more to their liking. Looks like a great recipe. how long and at what temperature should I bake them? Thanks! At the bottom of the post, it says, "Bake for 14-15 minutes at 350 degrees Fahrenheit." Okara is very moist, so it will make chewy cookies rather than crispy cookies. just had one for my supper fresh out of the oven. Used less sugar and I used brown rice syrup instead of molasses with cranberries and pecans. Very nice. Thank you for the recipe. Hi! Love your blog. Do you use cooked okara or raw okara? Unless otherwise specified, it's straight out of the soymilk machine, well-drained. There's a description in the sidebar. Used brown sugar and olive oil. Added 1/4 tsp baking powder. Turned out good. Will make again.